No doubt the paisley rainbow and the pot of whatever particles is just over the next hill. If one is neck-deep in the Big Muddy, what is there to do but to press on. As long as we're talking about new results, any comment on the EXO paper in Nature? The paper is on arxiv since February. But that's true: I should write one day about the progress in searches for the neutrinoless beta decay. I think the first link is wrong. Yeah, I'm aware of this, but i need to do some more research to decide whether it's serious. 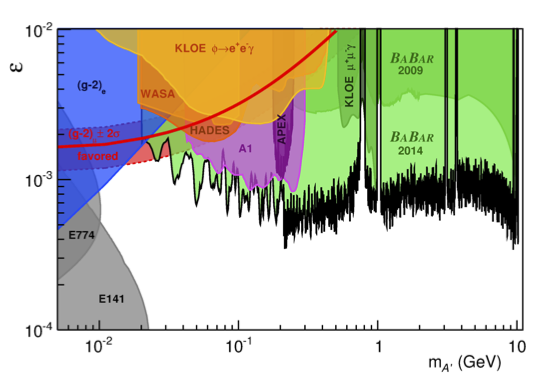 Along the lines of Dark Photons, do you have any comments to the claim of 3+ sigma sterile neutrino spectral line at 7keV from Chandra? So, you ever gonna blog again or not? There is no dark matter in Bob Holdom's model (He mixed 2 U(1)s Kinetically - which in fact one can get most naturally in supergravity with a nontrivial gauge kinetic function). Dark Matter came into the picture later on... Dark Photon is a poor label anyway, the extra spin 1 particle mass discussed is much closer to a Z prime mass than a photon (which has zero mass)...nevertheless....let the jargon parade on. "Dark photon is a hypothetical spin-1 one boson that couples to other particles with a strength proportional to their electric charges." My impression is that the majority of physicists strongly doubt the existence of the dark photon and that the graviton, the inflaton, the axion, the matter magnetic monopole, and the antimatter magnetic monopole are the only undiscovered particles that they would vote in favor of. Is my impression correct? Guys, sorry for late replies, I was closed for summer. and there will soon be a follow-up. Anon: It's true but "dark photon" is a cool name, better than "hidden photon". Personally i call dark photon rather than Z' as long as it is light enough such that its couplings to matter are proportional to the electric charge. David: It's true that currently there's neither theoretical nor phenomenological motivations for dark photons. It's just a toy model for new physics that is light but hidden from the usual collider searches.